Oh how we love games at Story Stage! I love that they bring people together, (AKA kids who’d otherwise be on social media in their bedrooms with the door closed), and I love that they can address all sorts of wonderful language-building skills under the radar. There must not be complicated rules. You must be able to play with kids of different ages and abilities. Here’s the thing: Families are busy. No one thinks they have time to play a game, especially on a weeknight. There’s dinner, homework, after-school sports and rehearsals, laundry, and oh … what? You have to bring snack for advisory class tomorrow? It’s 8pm and just now you think is a good time to tell me? Yes...I know. Believe me...I know. But here’s the other thing: The time you spend as a family is so fleeting and so precious. And there are so many things that demand our time. I encourage you to be purposeful about “game time.” Drag your kids kicking and screaming to come to 20 minutes of family game time just once a week. I guarantee after once or twice, they won’t complain anymore. They’ll look forward to it. And so will you. Please note: Story Stage participates in the Amazon Services LLC Associates Program, an affiliate advertising program designed to provide a means for sites to earn commissions by linking to Amazon. That helps support this blog by offsetting a fraction of what it takes to maintain the site, and is very much appreciated. STORY STAGE HACK: Divide the addictive little rubber figures into those that can be considered “characters” and those that can be considered “problems” or “actions.” For example, the princess, bird, baby, and dog could be characters. The phone, campfire, bed, and rocket ship could symbolize problems, or actions that the characters take to try to solve their problems. Start a story by drawing an environment card (WHERE) and a main character (WHO). Divide your family into teams. Each team then draws 5 figures from the bag, and takes turns completing the story with a PROBLEM, 1st ATTEMPT TO SOLVE, 2nd ATTEMPT TO SOLVE, and a BIG EXCITING MOMENT. Teams earn points for each element they include in their story. Bonus points if you add anything about how the character feels. These are the best sequencing cards ever! I love them so much! No reading required, except for the adult involved. There are 6 cards for each scenario: Playing Football, Setting the Table, A Trip to the Beach, Going to the Vet, Planting Flowers, The Hurricane, Making a Lemonade Stand, and Going to the Library. Again, this is not a competitive game, but with a quick Story Stage Hack, you can easily up the motivation and play for points if your kids respond better to that sort of thing. What I love so much about these cards is the “Hypothetical Solving Questions” provided for each scenario. This breaks the storytelling process down into easily digestible parts, so that “telling a story” is not so abstract and undefined. Use these questions to come up with a “problem” in your story. The picture cards give you the characters and setting...and voila! You have 3 story elements figured out! 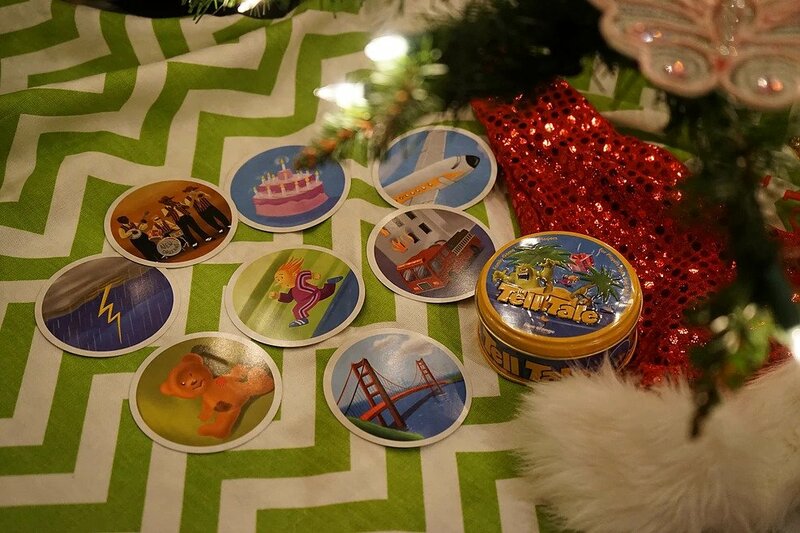 STORY STAGE HACK: First, mix up the 6 picture cards and have your kids put them in order. (If you need to up the ante here, divide into teams and time each team...the team who gets them in the correct order first wins. You can also sequence with only 3 cards for younger groups.) After the cards are in order, ask each team the questions provided on the cards that correspond to each picture. These questions are fantastic for predicting, inferencing, and building cause-effect understanding. (Again, divide into teams and award points for best answers if needed.) After sequencing and answering questions, have each team build a story, complete with the following story elements: WHO, WHERE, PROBLEM, ATTEMPTS TO SOLVE, CLIMAX, and RESOLUTION. For extra fun, have each team perform their “skit” for one another! We’ve had so much fun with this deck of cards, with a slightly older group. You do need to be able to read to play this game. I also would caution you that, unless you are playing with older teens, there may be some cards you’ll want to remove before play: killer, naked, drugs, lover? (But don’t let this scare you off! There are plenty of other cards!) Players are dealt a hand of 5 cards, each with a word or phrase and a number of points on it. The goal is to combine words/phrases to create story headlines in each round of play. The first one to reach 500 points wins the game. As long as the headlines are grammatically sound, they can be as outrageous as you’d like! STORY STAGE HACK: Play in teams. As each team creates headlines during game play, write them down on a whiteboard. After one team reaches 500 points, let all teams “go for the steal.” Each team should secretly choose a headline from the whiteboard. Set a timer for brainstorming for 3 minutes. After 3 minutes, each team improvises a story that would fit the headline they secretly chose. If the opposite team(s) can guess which headline was being acted out, they get a bonus 250 points! This is another collaborative storytelling game that is meant to be enjoyed without being competitive. We love the 60 illustrated cards, and the little tin box is small enough to toss in your purse for game playing on the go. Our advice is to take out 2 cards: the “toilet” picture and the “poop” picture, for obvious potty-talk control! STORY STAGE HACK: We like the idea of kids having some sort of structure when learning to tell a cohesive story. We teach kids 8 main story elements: WHO/WHERE, DESIRE, FEELINGS, PROBLEM, ATTEMPTS TO SOLVE, CLIMAX, AND RESOLUTION. Challenge your kids to use this structure when playing Tell Tale. If playing in teams, each team can earn a point for each story element they include. I cannot remember my life without Mad Libs. I played them as a little girl in the 1970s, played them with my college friends, played them with my own children, and still play them when I do speech therapy. (I also love the story of how Mad Libs were created back in the 1950s...check it out here!) The Mad Libs Game is total greatness!! This one is for ages 10 and up, and reading is required. There are Word Cards and Sentence Cards, and for each round of play, a Sentence Card is read aloud. Players choose Word Cards from their hands to fill-in-the-blanks on the Sentence card. The learning challenge is that you must choose the correct grammatical form of the word to complete the sentences. Struggling grammar learners are helped out by clever color coding on the cards: verbs are green, nouns are purple, etc. Players vote on their favorite silly sentence after each round of play. Continue playing rounds until someone gets 3 points! A: I don’t know how we are going to get that puppy out of there. B: Me either. I’ve already tried squeaking his favorite toy. A: Yes, and I tried offering him a treat. B: Well, he’s just scared and doesn’t want to come out. Besides being just plain fun, improvising lines in a scene such as this gives your child practice with inferencing, idioms, answering “who” and “where” questions, maintaining topic and creating cohesive conversations. 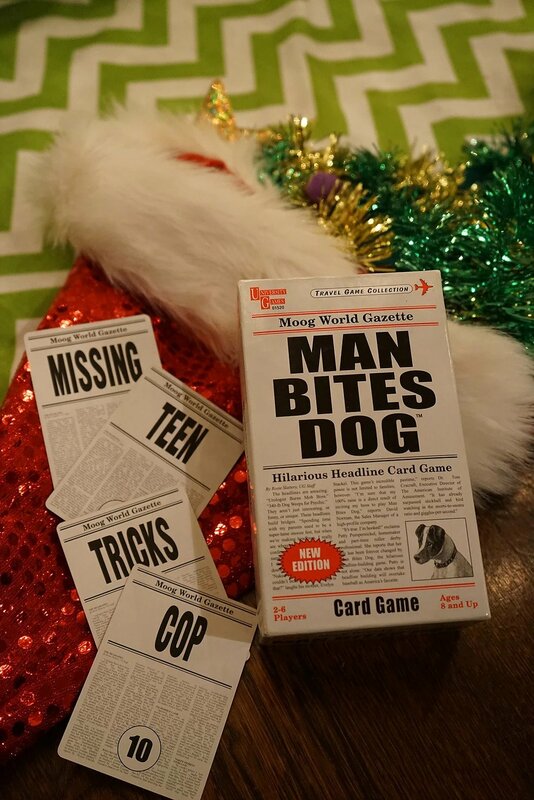 We hope you find some time this season to sneak away for Family Game Night. 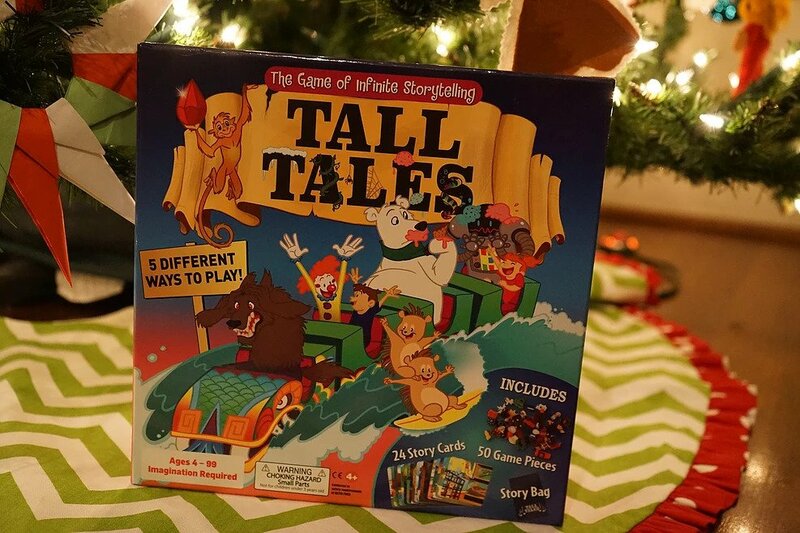 Or better yet, order a couple for Christmas presents, and make Family Game Night your New Year’s Resolution. Happy shopping!